Creep is defined as the time-dependent strain that occurs under load at elevated temperature and operates in most applications of heat-resistant high-alloy castings at normal service temperatures. The stress that produces a specified minimum creep rate of an alloy or a specified amount of creep deformation in a given time (for example, 1% of total 100,000 h) is referred to as the limiting creep strength, or limiting stress. 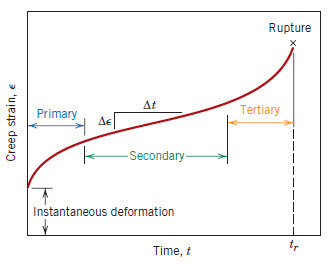 When the rate or degree of deformation is the limiting factor, the design stress is based on the minimum creep rate and design life after allowing for initial transient creep. 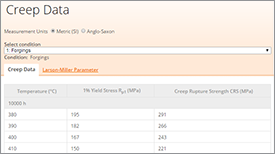 The stress that produces a specified minimum creep rate of an alloy or a specified amount of creep deformation in a given time (for example, 1% of total 100,000 h) is referred to as the limiting creep strength, or limiting stress. Stress rupture testing is a valuable adjunct to creep testing and is used to select the section sizes necessary to prevent creep rupture of a component. It should be noted that the long-term creep and stress-rupture values (For example, 100,000 h) are often extrapolated from short-term tests. 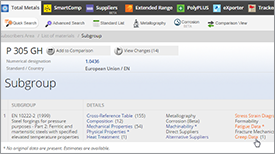 Whether these property values are extrapolated or determined directly, both methods will often provide accurate information on the operating life of high-temperature parts. The actual material behavior is often difficult to predict accurately because of the complexity of the service stresses, variation in application relative to the idealized conditions, uni-axial loading conditions in the standard tests, and also because of the attenuating factors such as cyclic loading, temperature fluctuations, and metal loss from corrosion. The designer and the metallurgist should therefore be prepared to anticipate the synergistic effect of these variables. During creep testing, the tensile specimen is subjected to either a constant load or stress at a constant temperature. Most creep tests conducted at constant load are concerned with concerned with information relating to specific engineering applications, whereas creep tests at constant stress are necessary for the specific understanding of the mechanism of creep. During the creep test, strain (change in length) is measured as a function of elapsed time. Creep test data is presented as a plot between time and strain known as creep curve. The slope of the creep curve is designated as creep rate dt/dε. A typical creep curve is shown in Figure 1. 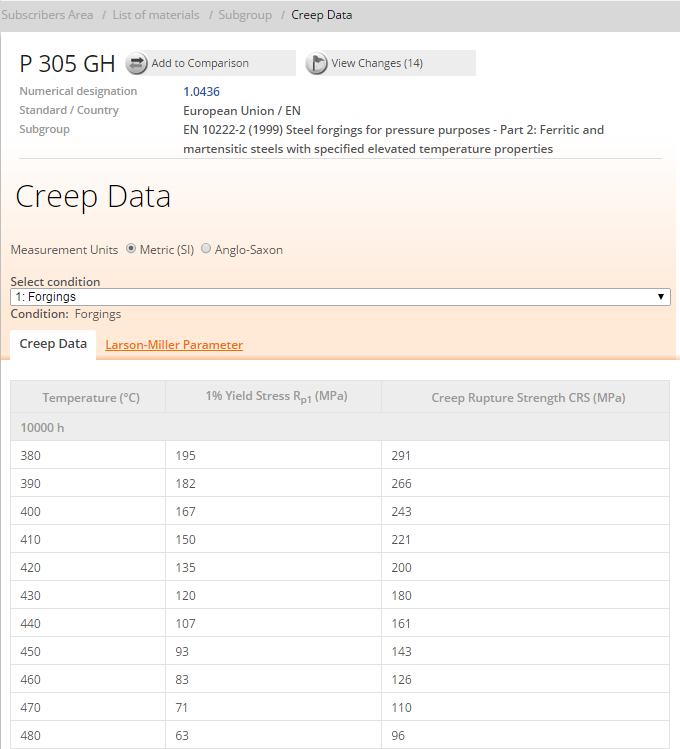 Primary creep: in which the creep resistance increases with strain leading to a decreasing creep strain rate. Secondary (Steady State) creep: in which there is a balance between work hardening and recovery processes, leading to a minimum constant creep rate. Tertiary creep: in which there is an accelerating creep rate due to the accumulating damage, which leads to creep rupture, and which may only be seen at high temperatures and stresses and in constant load machines. The stress to produce a creep rate of 0.0001% per hour (1% in 10,000 hours). The stress to produce a creep rate of 0.00001% per hour (1% in 100,000 hours or approximately 11.5 years). The first requirement would be typical of that for gas turbine blades, while the second standard would be most typically seen in applications such as those for steam turbines. If T>0.40Tm then creep is likely. For metallic materials most creep tests are conducted in uni-axial tensile mode. However, uni-axial compression tests are also used for brittle materials to avoid stress amplification and corresponding crack propagation. 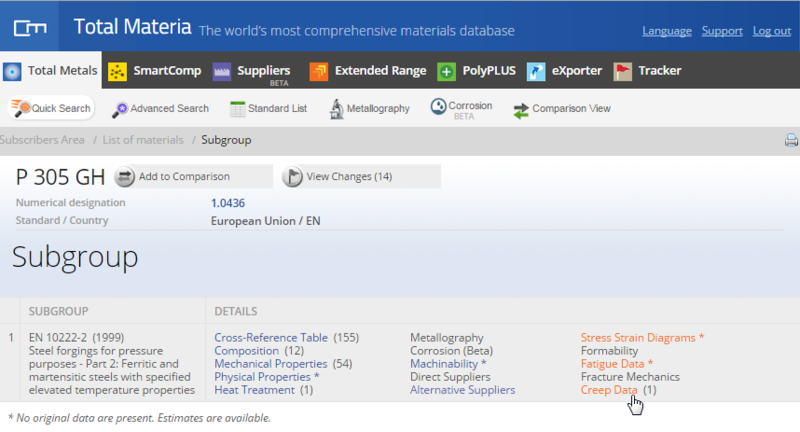 For most materials creep properties are independent of loading direction. The minimum creep rate is the most important design parameter derived from the creep curve. 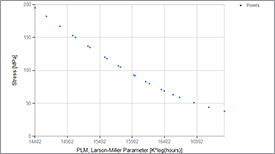 This particular engineering design parameter is primarily considered for long-life applications, e.g. nuclear power plant components. Conversely, for short-life components (e.g. turbine blades, rocket motor nozzles), time to rupture or rupture lifetime is the dominant factor in design. Minimum creep rate is attained using the stress rupture test which tests the material to the point of failure. This is basically similar to a creep test except that the test is always carried out at higher loads. In a creep test total strain is often less than 0.5%, while in stress-rupture tests it is normally around 50%. 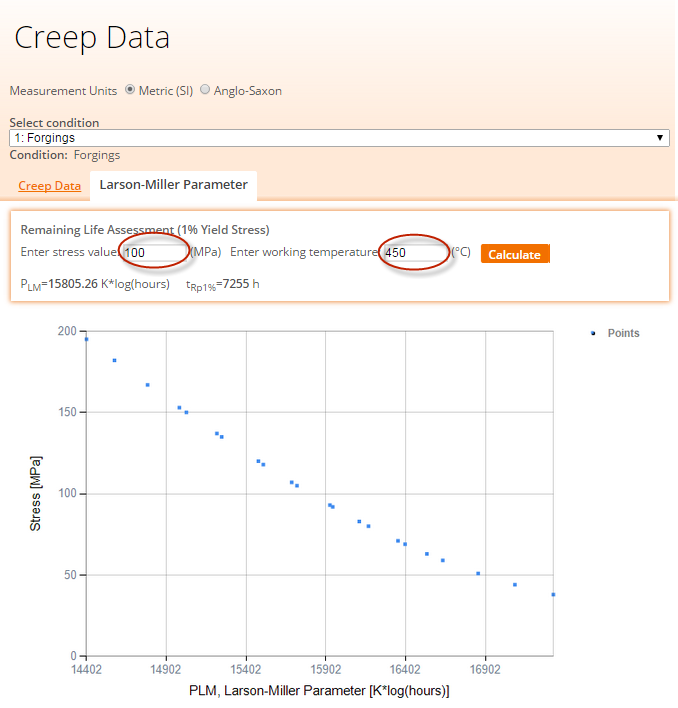 One of the most popularly used techniques in representing creep-rupture data is Larson-Miller Time –temperature parameters. This parameter can be derived from the stress and temperature dependence of the creep rate or time to rupture. The rate equation generally can be written in the form of the Arrhenius equation and expressed as PLM= T [21.577+ log (tr)].